With the winter going on in Melbourne right now, the holiday getaway to Borneo was much needed! In case you didn't know, I'm pretty obsessed with any trip, holiday, or a regular day where there are warm weather and water. 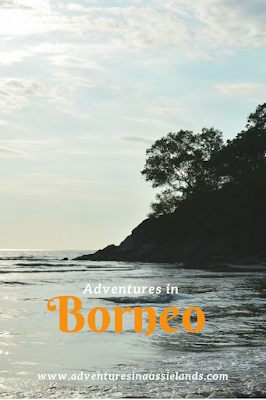 I had never been to Borneo and to be honest, I didn't know a lot about the island. I knew there was a big mountain which recently had an earthquake, and the locals blamed it on tourists stripping, and that there are heaps of orangutans. The first portion of our trip was spent just outside Kuta Kinabalu. Staying at the Shangri-La, allowed me to relax from all the stressors of the prior weeks. I was in heaven! Our room had a beautiful view of the beach, the little kid in me silently (or not so silently) jumped up and down at the sight of the waterslide in the pool, and I basically lived off peanut sauce and chicken satay for four days. I could live off peanut sauce for the rest of my life! Jumping right into the relaxing nature of the trip, days were spent drinking pina coladas, walking along the beach, sailing, and reading. The lovely view from the room. If you're staying at the Shangri-La (or visiting the area) be sure to book the Orangutang viewing at least a day in advance because it does book out. I was super excited about being able to see the orangutangs. I wish I could say my excitement lived up to actually seeing them. Yes, all the proceeds go back to helping fund the orangutang rehabilitation program. When viewing the orangutangs, there is a huge group of people viewing at the same time. There are two platforms for viewing which gives you ample opportunity to see the orangutangs. But it was a bit of a letdown. It felt like I was viewing orangutangs at the zoo. If I ever go back to Borneo, I think I would volunteer at the rehabilitation centre on the other side of the island or book an eco-tour to walk through the Bornean forest and see the orangutans in the wild. After a few days of being spoiled at the Shangri-La, we hopped on a flight to Tawau on the other side of the island. From there, it was just a short and exciting boat ride to Mataking Island. Seriously, it was a bit sketchy. I'm not sure if it was because we were so close to the Philippine border but halfway through the boat ride, we rocked up next to a large boat filled with armed men. My American nature slightly kicked in and instantly thought it was going to turn into a horror movie. Fortunately, I believe the only reason for the stop was to check visas and the number of passengers as the island has a maximum number of permits given per day. I do not think I have words to accurately describe how AMAZING this island is. It was like a little slice of relaxation paradise. The room was right on the beach, there was snorkelling, scuba diving, and a baby turtle parade every night. I must say the staff was absolutely fantastic! Having food allergies can make banquet style dining challenge, they always came to ask if I had enough to eat or if I wanted them to make something different. They were lovely! Best view to wake up to! I'm slightly kicking myself for not bringing my underwater camera. While snorkelling each day, there was a sea turtle that swam around right outside the room and wasn't too startled when I would swim down for a closer look. Each night at the turtle parade, staff would take some of the baby turtles from the hatchery and bring them to the beach so they could make their way to the ocean. Baby turtles at the turtle parade. The only disheartening thing about the turtle parade was that some of the guests did not listen to the staff members. People would not pay attention to where they were walking, cross the line the staff had set up, and pick up the baby turtles after explicitly being told NOT TO! It was so infuriating! Besides guests not listening to staff, it was quite disheartening to see the amount of trash that had built up on the island. While on the boat, a guest, threw a plastic water bottle into the ocean like it was no big deal! I realise the holiday was set up for relaxation but if the resort had offered a beach clean up program, I would have definitely participated. The holiday was a much-needed distraction during a very stressful month. I will definitely need to go back to Borneo to thoroughly enjoy all the beauty the island holds! I'm curious to know how you cope with stressors whilst on holiday. Has stress ever taken over a holiday? Let me know in the comments below! I envy you so!! I love reading about your amazing adventures!! And I can't believe how some people would pick up those baby turtles when they where told not too!! That infuriates me and I wasn't even there!! Maybe on your next adventure you'll remember your underwater camera as I would love to see what amazing pictures you could take!! Thank you for sharing your adventures!! I love it!! Yes! My next trip is to Cairns to dive the Great Barrier Reef so I will definitely be bringing my underwater camera! Thank you! I hope so too! Borneo is such a beautiful place. The baby turtles made the trip! I'm still fuming about all the trash on the island. I would love to organise a volunteer trip to help pick up trash around the islands but I have no idea how I would even start something like that. It really was a gorgeous place. The turtle parade was icing on the cake! Thank you! Traveling is just wonderful! Thanks heaps! Traveling is so amazing isn't it? It's great to experience new cultures and meet new people. Love this Article and also read about your Great Adventure 😀👍. We used to live in Sarawak, we couldnt visit much of Sabah, just the capital. The real beauty lies deep in the forests, am glad that we could live there. It was an amazing period. I definitely plan to go back and do more nature oriented things. It seems like it would be an incredible place to live!